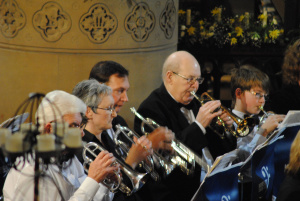 The Worsley Concert Band is a mix of Wind, Brass and Percussion players of mixed ability. Members come from all over Greater Manchester and surrounding areas, including as far afield as Stockport to rehearsals in the Swinton area. The ages of our members range from 10 years to 70 somethings which provides a great mixture of youth and experience. The Band tries to give all musicians in the area a chance to enjoy, practice and perform a wide variety of music, and welcomes all players. The Band is self – financing and members currently pay a small fee to cover the financing of the rehearsal room, whilst fees from concerts go to provide new music to add to the extensive library that has been collected from various sources over the past 30 years. Rehearsals are held every Wednesday evening at 8.00pm. They finish at approximately 9.30pm. The Band has recently had a restructure and has elected a new committee, we are currently working on an exciting and diverse concert programme for the coming year, holding a range of themed nights and a showcase which will give the band members an opportunity to perform solo and small ensemble peices. Worsley Concert Band is entering a new and exciting time, if you are interested in joining or watching the band please contact us for more information! The Band started life in September 1974 under the name of the B.O.C.Concert Band, and under the leadership of Mr Jim Cooke. Originally there were only 9 members of the Band but this soon swelled to 25 over the next few months. The Band rehearsed at the B.O.C. site in Swinton, Salford. Even from this small beginning, there were regular concerts in and about the Swinton area and by the early 80’s the Band were playing at 10 different venues during the year. These included Broughton House (a home for disabled ex-servicemen) and Swinton Children’s Hospital, as well as local clubs and church halls. Various members of the Band had come and gone over that time but a stable group of members remained and loyally attended weekly rehearsals and concerts. By the end of the 1980’s, weddings were added to the Bands playing venues. The 90’s started with several of the members becoming famous, though not for their musical ability! One become the temporary landlord of the “Rovers Return” whilst another invented a revolutionary laser treatment for treating certain types of skin cancer. The highlights of this decade were the 20th & 25th Anniversary concerts in front of a 500 strong audience, which led to the making of two Band videos. The start of the new millennium led to a big change for the Band. They were no longer sponsored by B.O.C. and because of that had to change their name. 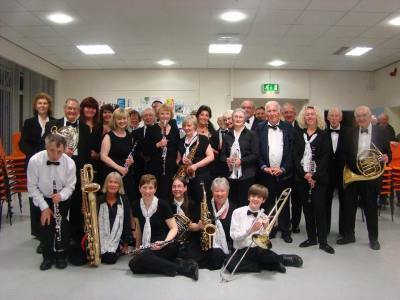 After a great debate they became The Moorside and Wardley Concert Band, and changed rehearsal venue to a community centre in Swinton, where they still meet. In this time came the semi- retirement of Jim Cooke, the Bands long-time leader, to the cornet benches, whilst Richard Hart, formerly of the Clarinet section to the role of conductor. The beginning of 2004 saw yet another name change for the Band. 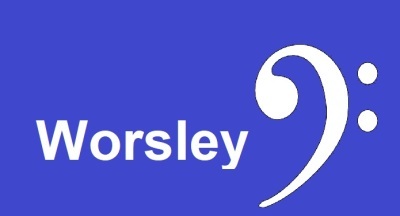 The Moorside and Wardley Concert Band was a long and unwieldly title so it was agreed that the band be known as The Worsley Concert Band. Along with the name change came a new librarian and new music. The year 2007 saw conductor Richard Hart with a change of job meaning he was no longer able to attend Band so Jim Cooke once again took over as the regular conductor. The summer of 2017 brought more changes with the retirement of Jim Cooke as conductor of the band. Chloe Flanagan, a graduate of the Royal Birmingham Conservatoire and Woodwind specialist, took the position of Conductor in June 2017. The band elected its first formal commitee in the following months and continues to move from strength to strength.